Sudan (officially the Republic of the Sudan) is a country in northeastern Africa. It is the largest country in Africa and in the Arab World, and tenth largest in the world by area. It is bordered by Egypt to the north, the Red Sea to the northeast, Eritrea and Ethiopia to the east, Kenya and Uganda to the southeast, the Democratic Republic of the Congo and the Central African Republic to the southwest, Chad to the west and Libya to the northwest. The world's longest river, the Nile River, bisects the country from south to north. The main exports are cotton, gum arabic and peanuts. The Sudanese pound is the currency of Sudan. Arabic names for the denominations appear on Sudanese coins. We occasionally have a small selection of Sudanese gold coins in stock. We show the specifications here of the most frequently held coins, followed by a list of coins most recently available. 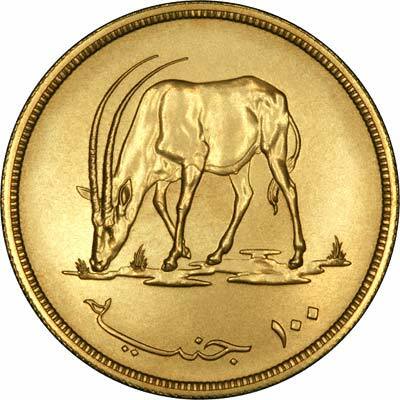 Technical specifications of the most frequently encountered Sudanese gold coins. 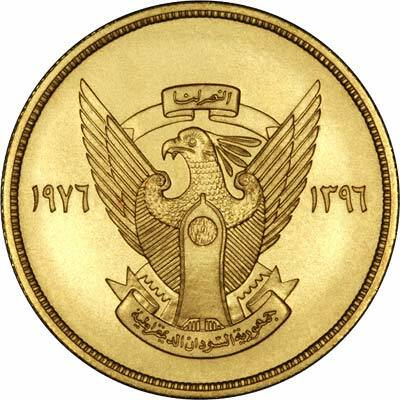 We make an active market in almost all world coins, gold or otherwise, including Sudanese gold coins. If you have any of these coins to sell, please contact us, or post them to us for appraisal and offer.